I Run Ultras.com: Reasonable, Rational Rule, or Runner Discrimination ? Reasonable, Rational Rule, or Runner Discrimination ? In an April 19, 2008 post titled "Runners - Are We Taking Over The Trails?" we talked about whether or not an increase in the number of runners over the last several years translated into an over-crowding of your favorite running routes, trails, etc... 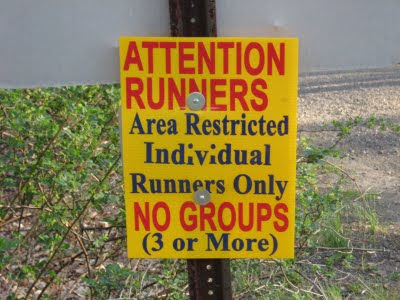 In fact, back in April of 2008 signs appeared at The Rockefeller State Park Preserve, a park run by the State of New York, prohibiting group running (3 or more runners) in certain parts of the Park (basically around Swan Lake). In March of this year there were rumblings about park administrators instituting and enforcing an even more restrictive rule - a "walk only" rule during certain hours of park operation. This rule would act to completely prohibit running in the Swan Lake area during certain weekend and holiday hours (11:00 AM to 5:00 PM). Now, for me, I spend a good 4 to 8 hours a day at Rockies on a normal Saturday and Sunday, so typically my training runs would fall within the restricted hours. Yet, there are miles and miles of park trails available to runners, and such a rule would not have a tremendous impact on my training. However, there are many who feel that a rule such as this would be discriminatory, set without any reasonable or rational basis (despite any claims that park attendance is the greatest during these hours and that such a rule would act to keep the Swan Lake area more peaceful for those that do not come to the park to run). There are also those that feel it would create a situation where runners (particularly female runners) would be forced to leave the Swan Lake trails (located adjacent to the main parking lot) for more secluded areas of the park, thus creating a safety issue. Well, it is official. They have done it. "To ensure tranquility for all," both Swan Lake and Brothers Path are "Walk Only" from 11:00 AM to 5:00 PM on Saturday, Sunday and Holidays during the months of July, August, September and October. On my run today at Rockies I met a runner who was actually chased down by park management (in a golf cart) last weekend and yelled at for running in the restricted area during the prohibited hours. These signs are placed on various trails that act as gateways to the Swan Lake and Brothers Path sections of the park. While they may be there in an effort to ensure tranquility for all, they certainly take away a lot on an aesthetic level. Is this rule fair? Is it reasonable and rational given the facts and circumstances? Does the preserve manager have the legal authority to establish such a rule, and if so are there notice requirements coupled with a right of the impacted parties to be heard? I for one have never experienced congestion in these areas of Rockies, let alone anywhere else in the park. Sure, there have been occasions where I have encountered large groups of runners, usually college or high-school track and/or cross country teams, that fail to yield to oncoming runners and walkers as they take up the entire trail running 3, 4 and more abreast (in fact, on two occasions I was actually shouldered off the trail by these large groups). However, this is a rare occurrence (although it is likely the type of situation that the rule should really intend to prevent). The reality is that the exercise of common sense and courtesy would solve it all, not just by runners, but by all park patrons. It is so simple, isn't it? When you see other people coming toward you, whether you are a runner or walker, move over a bit. If you are runners in a group of 3, 4 or more, run single file to the far right of the trail until you pass the oncoming runners/walkers. Similarly, if you are out there with your family and see runners coming toward you, move yourself, your 6 kids and 5 dogs over a bit and let the runners/walkers pass. Right? Isn't it that simple? Wouldn't that eliminate the need for a "walk only" rule? And, why not a "run only" period? How about making the Swan Lake and Brothers Path sections "run only" during the hours preceding 11:00 AM and after 5:00 PM? Would that be fair to the non-runners? Not any more so than a "walk only" rule. Well, one thing is for sure - people will have different opinions on the subject, and while I am indifferent to it all as it does not have an impact on my training, I do understand those runners that feel as if this "walk only" rule is discriminatory, and I do feel for those runners who typically run during the prohibited hours and do not feel comfortable leaving the Swan Lake area from a safety standpoint. The debate continues, and it is sure to get heated. Regardless of how it plays out, Rockies will always be an amazing place for runners and non-runners to escape the hustle and bustle of city life. A gem in Westchester County, with miles and miles of beautiful, scenic trails. The only question is - can you run or do you have to walk? As they say in ultra running, run when you can, walk if you must, and make sure you can outrun the park management golf cart if you choose to run in the restricted area. It is also rather abusive that Preserve Management hosted a fall and spring race to raise money for the Preserve and then did this. Further, $5,000 was donated to the Preserve specifically for the repair of the Old Croton Aquaduct Trail from Sleepy Hollow HS to Rockwood. Almost a year later, little work has been done. Footing remains very dangerous in several areas. Nothing was done to widen the trail from the school to make this path more inviting and thus serve as an option for traffic at the Preserve HQ area. Where is our refund for all of this money as the trails have not been improved and the "good will" that was to come with this money has been thrown in the face of runners with this "no running" rule. When a state-funded park has management chasing high school kids in a cart because they ran in a group of 4 and had a desire to chase all school teams out, there is a serious problem. Don't we want kids to exercise instead of being fat and taking up drugs? This is a serious matter of one individual being anti-runner and anti-youth. I agree with you, Tony. No doubt the rule was conceived and executed by sedentary people who see runners as aliens and as a threat (to what I don't know). It's also possible that it came as a result of inconsiderate behavior on the part of runners. Regardless, what should be a matter of common sense and common courtesy has turned into an overrestrictive rule. As Bob said it is a serious matter and I hate to think where it might lead. Same thing has happened here at one of our "Nature Centers". Yeah...what about hours for runners only? I can't wait 'till someone tries to chase me down and tell me not to run in a "restricted zone". I will look forward to telling them to go "f" themselves. Very interesting. I do like your point that why not have either a "runners only" time schedule where nobody is allowed to walk; or the other option of posting single file rule. To discriminate against just runners isn't fair. On a side note, I ran up in the Rockies for just over 3hrs today. And for some reason I have 3 blisters and a black toe nail. I need some new socks me thinks. Any suggestions? I see you use DryMax, how are they? Are you blister free? There are speed walkers who could easily walk faster on that trail than joggers. So the question then is this - what do they have against people who bounce a little while they move forward? Hey Peter - buy a set of DryMax socks - you will NEVER regret it. That is totally crazy and unfair. As somebody who was introduced to trails there, I would be pretty pissed if I couldn't do my lunch runs beginning around lake. Bummer! Ran there yesterday at 11 am with ultra great Dave James to see what was up. 20 people at pond. All runners. No walkers. Manager was hiding in office. Talked to triathlete Tom Miller who told horror story of being chased by manager in her SUV. Didn't even know why. She was screaming at him and almost hit him several times. He made complaint to State Commissioner, the Governor and the local papers. He could have been seriously injured over her freak behavior. No reason for this at all. Just stay right, slow if needed, smile and all can get along without a need to "control" runners. In the 90's there were many bond elections to purchase tens of thousands of acres in the Austin area. It was positioned to be for the citizens. None of the purchased land with taxpayer money has been opened to the public. It's the private playground for the city biologists to do bird counts, trap wild pigs, and catalog invasive plant species. I'm all for environmental accountabilty, but they take it to the extreme around here. The city has exploded in growth over the years and, due to the very active outdoor population here, we are bursting at the seams. Yet, the city continues with their normal modus operandi. They instituted a running ban on a very popular trail here too, but it's been pretty widely ignored. Of course, now the entire state park is marked to close because CA has no more money. I'm sure runners will still come, and they'll need to come in packs for safety. I'll be devil's advocate on the group thing. We have a marathon training group that is hundreds large. They overwhelm any path they take and if it's a particularly ecologically sensitive place, it's trashed by the time they are through. It's not intentional, but it is difficult to avoid with that many people running in packs of four or more for extended periods of time. They drop stuff too and litter w/o meaning to. Now, imagine that scene played over and over in a day's span. I'm not sure running in packs of four is any harsher than packs of three, but it beats packs of 400. -During the months that they have the running ban in place, most serious runners are finished (or finishing) their runs by that time in order to beat the heat. -Most serious runners don't spend that much time on the swan lake trail as it is a roughly one mile flat loop. -As has already been stated, there are are miles and miles of trails on the preserve. As most of us know, many of these trails don't get many walkers, precisely because they're not flat loops. I haven't heard of anyone even remotely alluding to more restrictions for runners. So while I do think this ban probably an over-reaction, I do think that to make such a big deal out of it is also an over-reaction. Finally, while I'm sorry to hear that some runners have been harassed by park rangers enforcing this restriction, (and I don't doubt their stories) I have found the preserve management to be cooperative, especially in accommodating group runs. One more thing, I regret the use of "serious runners" in my last post. Anyone out there running the hills of Rockefeller is serious and deserves the same consideration and respect. It was a poor choice of words. Thanks Seth. I thought your comment was great, yes, with the exception of the "serious runners" reference. I tried to send you a note on the Higdon forums but don't know if it worked.